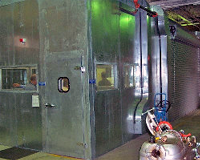 Noise Enclosures for: ball mills; glass tempering lines; boiler feed-water pumps; foundry shake-outs; operator pulpits; water-jets; printing press folders and high-pressure blowers. This is a view of the furnace end of a glass tempering line enclosure. 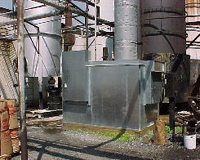 A special removable hatch panel provides maintenance access to the furnace. This enclosure reduced the noise levels as measured at the Control Panel in front, from 105 dbA down to ambiet levels which were 83 dbA. A modular panel enclosure provides approximately 20-25 dbA noise reduction for a non-woven carpet machine. Specially designed rolling panels that move on existing crane rails, enable safe access to drive motors for replacement. The enclosure is from the floor to the building roof and the panels were notched to accommodate the roof trusses. 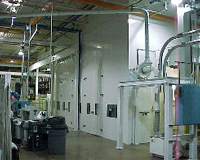 This modular panel enclosure from floor to the plant roof, contains the noise from the Quench and Cooling sections of a glass tempering line. Noise reduction averaged 25 dbA. The double doors with cam-lift hinges, eliminate the need for a threshold while still providing a good acoustical seal at the floor. The double-paned windows provide excellent noise reduction while allowing good visual access inside the enclosure for both visitor viewing and personnel safety. 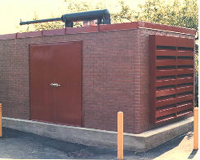 The architect for a major university wanted the noise enclosure around an Emergency Diesel-Generator, to blend with an adjacent dormitory building. This requirement was met by covering our standard acoustical panels with artificial, fiberglass bricks. The Intake and Exhaust silencing for the engine cooling air was accomplished with acoustical louvers as seen on the end of the enclosure. Neighbors of a roofing shingle manufacturer were concerned about the noise from a process blower. The solution was to enclose the blower and a portion of the exhaust piping going into a process vessel. The enclosure included a silenced ventilation system for cooling the blower and motor. 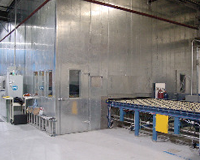 This panel noise enclosure around a valve test area with an integral Control Room protected the technicians from the 105-110 dbA test levels. 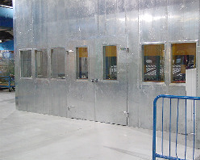 The large double-paned windows with a nominal 4″ air gap, provide good viewing of the testing while protecting the personnel from the high noise levels.